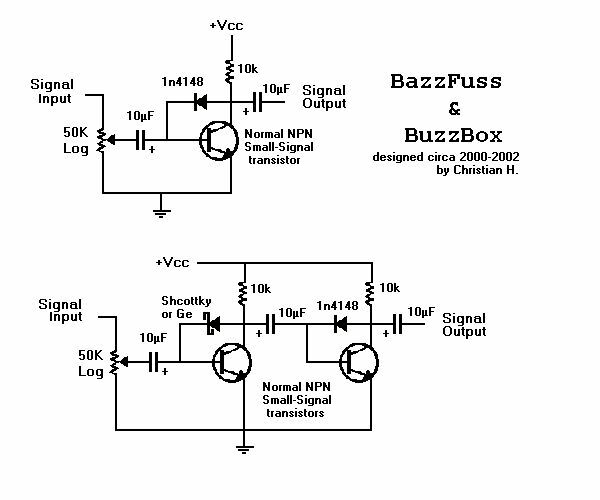 The bazz fuss is a ridiculously simple project. Designed as bass fuzz by Hemmo Christian 5 components take the bare minimum of parts to take your sound to hell. This pedal is really fun to play with it has a nice nasty silicon fuzz with a velcro decay. There is just one control VOLUME. You can roll back the volume on your guitar to "starve" the fuzz and get really splatty stacatto sounds. My favorite part about this pedal is it has a built in gate effect so it is very clean and low noise for a high gain fuzz. Perfect for single coil pickups.